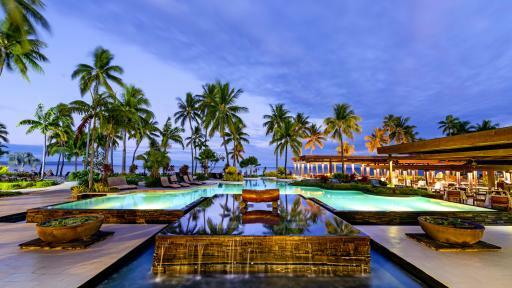 Set on the western side of Viti Levu, Fiji's main island, Hilton Fiji Beach Resort & Spa is just 20 minutes from Nadi's International Airport. Looking out over a private 1.5 kilometre private beach to the warm waters of the Pacific Ocean, accommodation ranges from Guestrooms to spacious 1, 2 and 3 Bedroom apartments and penthouses. Featuring ocean views, the resort is complete with all of the excellent facilities you'd expect of the Hilton brand including 7 swimming pools, restaurants, day spa and a range of water-based activities. 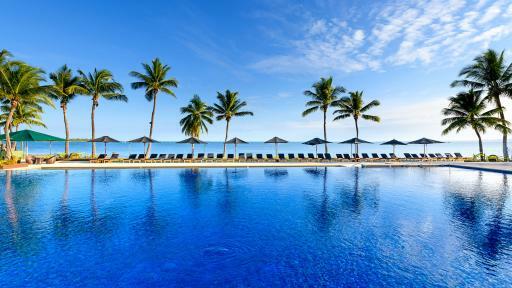 Radisson Blu Resort Fiji Denarau Island is just 20 minutes drive from Fiji's International Airport and is a luxury resort offering deluxe accommodation ranging from hotel rooms to 1 and 2 Bedroom self-contained apartments spread out over 3 floors. 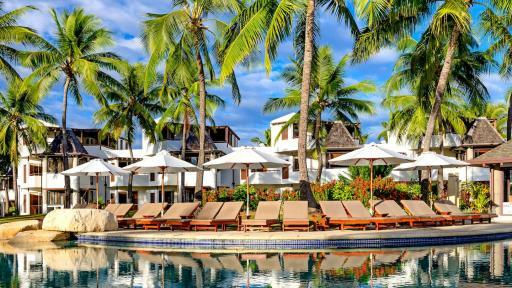 With a full range of facilities, guests of the Radisson Fiji enjoy exclusive access to five lagoon swimming pools, day spa, kids club, restaurant and bar as well as island tours, fishing, golf, beach activities and water sports. 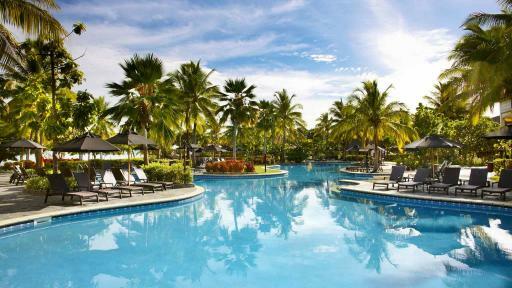 Set on the beautiful Denarau Island, Sheraton Denarau Villas are an absolute beachfront resort just minutes from Nadi. These luxurious villas are perfect for families and groups or for guests on extended stays and share an excellent range of facilities with its sister properties Sheraton Fiji Resort and Westin Denarau Island Resort & Spa. With an exclusive beachfront location, Sheraton Fiji Resort is surrounded by the beautiful natural environment of Denarau Island and boasts all the luxury inclusions. Featuring spacious rooms with contemporary finishes and stunning ocean views, the Sheraton Fiji Resort shares a fantastic range of facilities with the Westin Denarau Island Resort & Spa and Sheraton Denarau Villas. Guests will enjoy access to 12 restaurants & bars offering casual outdoor and fine dining. 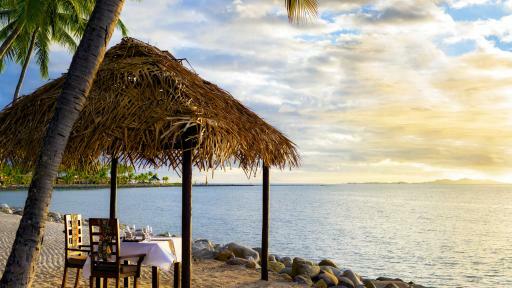 Nestled on Denarau Island on Viti Levu's west coast, Sofitel Fiji Resort & Spa features luxury beachfront accommodation only 20 minutes from the airport. Neighbouring the Denarau Golf and Racquet Club, the resort offers a range of fantastic facilities. With a contemporary blend of traditional Fijian and classic French Polynesian style, Sofitel Fiji Resort & Spa is your home away from home on your Fiji holiday. 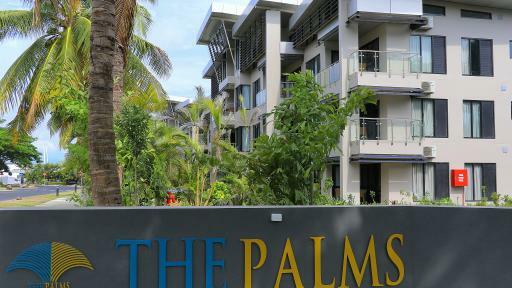 For modern and comfortable self-contained accommodation in the heart of Port Denarau you can`t go past The Palms Denarau Fiji. This Fiji accommodation offers spacious 1, 2 and 3 Bedroom Apartments as well as Guest Rooms (studios) and is a great base for your family or friends on your next Fiji holiday. The ideal location allows you to explore the best of Fiji and her islands with ease. Although the smallest resort on the island, The Terraces Denarau Island is big on personal service and a friendly atmosphere. Accommodation is ideal for families with all apartments coming fully furnished and enjoying views of the Nausori Highlands or the 18 hole championship golf course. Convenient accommodation at an affordable rate, The Terraces Denarau Island are sure to impress. A beachfront resort nestled in a tropical garden, The Westin Denarau Island Resort & Spa blends luxury accommodation with traditional Fijian architecture. Conveniently located close to Nadi town, International Airport and Port Denarau Marina, The Westin Denarau Island Resort & Spa offers a great range of facilities and a warm and friendly insight into Fijian culture.